Increasing awareness of male subfertility. 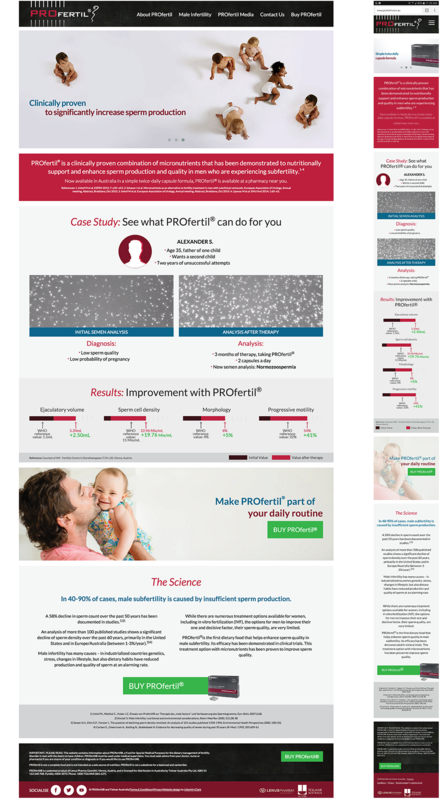 Profertil already had a web presence in Australia that was largely based around the European site. It had little depth, very little SEO friendly content, and was performing poorly. We were asked to audit the current site and provide an economical solution that would drive brand awareness and convert. We created clear paths to purchase with logically placed CTA’s preceded by compelling content. We had to work within the current brand guidelines, but it was also necessary to create some humanity and focus on not only the product but the benefit. Always with the user front and centre, we created easy to understand clinical references with supporting visuals. We utilised copy supplied by the client and rewrote where necessary to create a more SEO friendly site. We created a number of unique pages that encouraged users to dig deeper into the site (such as Tips to Conceive) which have become high traffic pages for the site since inception. Understanding the product and creating valuable content speaks directly to the target market.